Project: Beachtree Restaurant 2009, Four Seasons Resort Hualalai, Hawaii. The Beach Tree Restaurant, Four Seasons Resort Hualalai was an extensive renovation doubling the size of the kitchen, dining and bar areas. As an ocean-front project it was in the FEMA designated A-E Flood Zone and required special structural, mechanical and electrical engineering accommodations as well as flood-proof detailing. The kitchen was steel reinforced concrete built into grade with sod roof, matching existing for minimal view disturbance to nearby guest bungalows. The original dining and bar areas were removed. 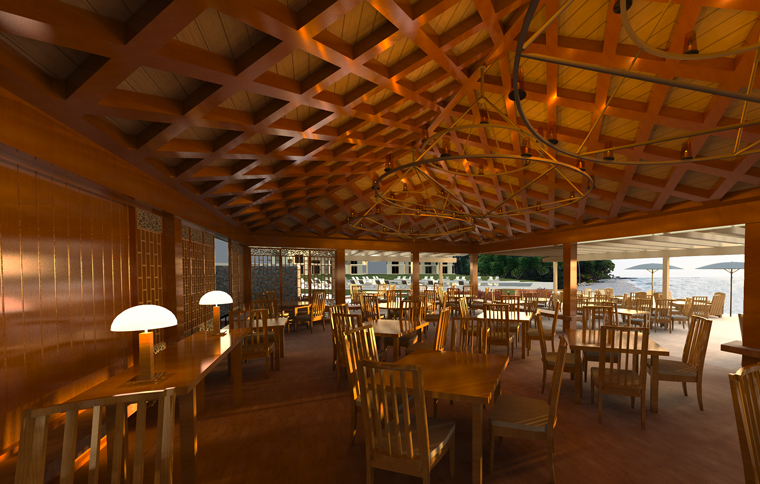 The new pavilion and trellis dining are structural-steel framed with African mahogany, cedar and Ipe finish surfaces. The trellis has electrically operable sun shades. The new bar is timber-framed with ohia and the roof is thatched. An expansive lounge deck with autograph trees and shade umbrellas joins all of the areas together. This was a complex project, and had multiple on-the fly scope adjustments with a limited design / construction schedule. Collaborators included John Hill / HKS Hill Glazier Studio; Michael Booth, Janet Mercier / BAMO; Jim Hyatt, Chris Pulaski / James Hyatt Studio; Hiram Banks, Kristen Peck / H.E. Banks. Consultants included Trina Onuma / Belt Collins Hawaii; Bill Blakeney / William Blakeney Structural Engineers; Mark Morrison / Morrison Mechanical Engineers; Halina Gruszka / Lighting & Engineering Integrated; Richard Sinner, Specifications West. The Contractor was Nordic PCL Construction.